WELCOME TO THE CHAMPION'S CHOICE ROSETTE SHOP - NOW OPEN! All Postage is Royal Mail 2nd Class for UK orders or Airmail Small Parcels for International orders. 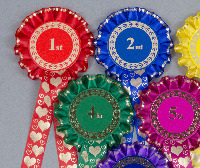 Please contact us if you require your rosettes urgently.